The term fascism comes from the word fasces; an ax tightly wound with sticks. Fascism can be defined as a political attitude and mass movement that arose during time between the first and second World War. Fascism is the attitude of giving full interest in economic, social, and military power to a dominant race or state lead by a single dominant leader. Fascism basically rejected the idea of Socialism, Capitalism, and Democracy. Fascism’s are single-party dictatorships characterized by terrorism and police surveillance. It focuses on ethnicity and “our” race being better than “your” race. Fascism isn’t limited to one culture alone. Each culture can believe that it is better and each person can consider himself to be better than his fellow man. Fascism is used to categorize censorship and oppression. Ones who take away freedom from others can be considered fascist. Several countries embraced fascism between World War I and World War II. Some, such as Norway, Denmark, Great Britain, Belgium, and France, had large fascist movements. Others, such as Spain, Austria, Hungary, Rumania, Poland, and Finland, gained substantially fascist governments. Fascism had the largest effect on Italy and Germany. The death toll due to fascism in Germany was the highest. It was the Holocaust in Germany that was the most significant. Other countries amounted significant losses of life due to secret police and the removal of unwanted ethnic groups. Other fascist countries had a very small death toll, and others did no kind of ethnic cleansing at all. Great Britain still had a fascist movement though, and a sizable fascist political party. The amount of censorship and racism in Great Britain was small compared to Italy or German. Poland was hardly a racist or censored country. Poland had a government where the military ruled the people, and it had a fascist political party. Poland was a fascist country to a certain degree. Not all countries have to have an open, fascist, ruling government to be considered to have elements of fascism. Many aspects of fascism are still around today. The idea of fascism can never be wiped out because it is an idea. Until there are no more absolute leaderships by a single person, there will still elements of fascism in the world. Fidel Castro is a dictator in Cuba today. Augusto Pinochet is the dictator of Chile, Sadam Hussein is still the dictator of Iraq and he is very fascist. There is also no way to wipe out ethnic and racial hatreds. People have hated each other for thousands of years. Try as we might, the road to equality is still a very long one. There is no way to make up for thousands of years of oppression. No matter how hard you try you cannot convince an ignorant bigot to love a person he has hated unjustly all his life. There will always be some amount of separation between blacks and whites, gentiles and Jews, and Native Americans and white people living in America. Fascism is everywhere, and it is all around us whether we notice it or not. Some censorship protects our children, but too much limits our freedom of speech. Fascism is a very complex topic because of these reasons. Fascism has been around for a long time and will be in our future. Mussolini was started the Fascist Party in Italy. He was expelled from the Socialist party in 1915 and he then went to fight in WWI. He was injured and returned to Italy and started a new political party, the Fascist party. The Fascists centered on an Ethnic state, in which they are all united by their heritage and looks. The Fascist party was very violent and soon spread to many areas of life in Italy. The police soon came under control by the fascists and the fascists even started their own militia. The violence increased and freedom was lessened. Secret police and assignation teams (also known as black shirts) had control of the streets. The fascists were very pro-violence, anti-democracy, and anti-communism. The Party believed in only one absolute ruler and the retraction of many freedoms. All other political parties were banned in Italy, so were labor unions. Books and papers were censored, and education was reviewed so that it would favor the fascist government. Mussolini helped the public by the use of public work camps, which gave jobs to the large number of unemployed people in Italy at the time. It also provided Italy with new and improved roadways. Fascism brought a sound economy to Italy during the Depression, but at the cost of freedoms. Benito Mussolini and the Fascist party lost popularity by siding with the Germans. Becoming allies with the Germans became unpopular when the Germans started to lose the war. Public opinion in Italy of Italy’s involvement in the war became extremely negative when the Allies invaded Italy. In April 1945 Benito Mussolini was shot and hung upside down with many of his fellow fascists. The fascist movement was made illegal after the resistance killed Benito Mussolini, and without a strong leader the Fascist party crumbled. http://www2.bbc.co.uk/education/modern/fascism/fascihtm.htm#q1 This site was a good site, it has several very informative timelines. It also explores several commonly asked questions, and answers why and how Mussolini came to power. The source also helps to define what fascism is and what it does. This site is from the point of view of the Italians and tells of the mistakes of Mussolini. This site is mostly text about fascism and Mussolini. http://www.brown.edu/Research/Journal_Modern_Italian_Studies/1.3/ This site is very professional and has their sources cited on the page. It is a research journal from Brown College and the information seems to be accurate. It is mostly text and lends more insight into how fascism gained popularity and came to power in Italy. This site also has several links on it. Benito Mussolini was born on July 29, 1883 outside the village of Predappio in the Northeastern Italian Province of Forli. Benito Mussolini had one brother and one sister, Armaldo and Edvige. He first worked for the socialist party and then was expulsed from that party because of his Pro-WWI views. He was drafted in September of 1915 and when he returned form that war he started the Fascist party. After gaining much support he demanded that King Victor Emmanuel III appoint him Prim Minister of Italy. In October 1922 he became prime minister of Italy. The fascist party then won the next election and Mussolini too over as ruler in 1925. They called him “Duce” (leader) because his title was “head of the government”. Mussolini made his image to be that of a superman, and that he was to be absolute in his power. Mussolini spread fascism to other countries. He invaded Ethiopia in 1935 and made that country a fascist colony. Mussolini allied Italy with Nazi-Germany during World War II. The Nazi party was modeled after the fascists. Many opposed this alliance and it made Mussolini unpopular with his people. Mussolini had to flee Italy, he was helped by the Germans and hid in Germany for a while. Mussolini tried to return to Italy and gain power but was overthrown in 1943 when Allied forces invaded Italy. He was shot in 1945 when he tried to flee the country. His body has then hung up to show how badly he was hated for his involvement in World War II. http://www2.bbc.co.uk/education/modern/fascism/fascihtm.htm#q1 This site offers a timeline of Mussolini’s acts as ruler and his rise to power. The source has an objective point of view and states many facts. This site was made to educate people about Mussolini’s life; there is text on his life and a few pictures of Mussolini. It shows the positive things he did, such as jobs and the elimination of unemployment, and the negative ones, such as censorship and the elimination of political parties other than fascism. It also has links to other sites on fascism. http://www.euronet.nl/users/wilfried/ww2/mussolin.htm This site is a biography of the Italian dictator covering the rise of Italian fascism in between the wars and the period of fascist dictatorship. It offers much information on the entire life of Mussolini. It is useful if you would like to learn more about the dictator. 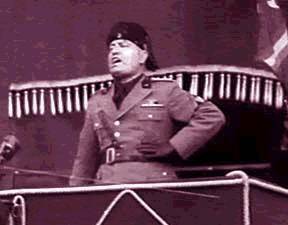 This is another excellent site to learn about the life of Mussolini. It has only two pages of text all about Mussolini, it was written as a report on his life and it emphases his life as an adult and is short and to the point. In 1933 José António Primo de Rivera, son of the former Spanish dictator, founded the Falange Española political party. This was a fascist party that put great emphasis on the following of Spanish traditions. This group joined its militia with the militia of Francisco Franco in 1937, the organization was renamed Falange Española Tradicionalista and was made the official party of the Nationalist state. Franco then ruled fascist Spain as a dictator in 1947. He took over rule from Primo de Rivera, who was ruler at that time. Franco was not a very oppressive leader but he did limit the freedoms of his people. Under Franco’s rule there was little freedom of speech, no freedom of the press (massive censorship), no right to voting, and even no freedom of religion (the only religion that was allowed was Catholic). These lacks of freedom were very basic for fascist rule. People in Spain did enjoy some freedoms though. They were able of own land and were permitted to travel freely throughout the country and leave the country if they wished to. Francisco Franco was in complete control of Spain from the time he took over in 1939, to the time of his death on November 20, 1975. Fascism was then dissolved in Spain when Franco died. Franco decided to turn his role as ruler over to Don Juan Carlos before he died. Carlos was of a ruling bloodline and Franco appointed him as his successor. With the help of Adolfo Suarez, Don Juan Carlos then started the long process of turning the Republic of Spain back into a democracy. http://flag.blackened.net/revolt/spaindx.html This site is dedicated to the Spanish civil war and how Franco and fascism came to power. It is a historical account to the war and is a huge database for the people and places involved. It also discusses the event after and leading up to the war. This site has a large amount of text on this subject of the war and a few pictures of Franco and his troops. This web page was created as part of the International Anarchism web pages. It is full of Spanish history and is intended to inform about Spain. http://flag.blackened.net/liberty/spain-rev.html This site tells about the Anarchist movement and how it was started, gained power, and what it became. It is also about the actions of Franco while he was in power. It is an excerpt form Anarchy: A Graphic Guide, it consists of text and a few illustrations of Spain at the time. This is a good site is you would like to know about the thoughts and mentality of the time. Francisco Franco was born in El Ferrol in Galicia in 1892. In 1907, he joined the Infantry Academy at Toledo and graduated at the age of 17. He showed great ability as a leader and was quickly promoted to higher rank. He was soon the youngest captain in the Spanish army, and was the hero of the campaigns in Morocco. He had only minor setbacks and in 1935, he was appointed Chief of the Spanish Army's general staff. Franco threatened to take over the Spanish government, but be for me could he was appointed to the job. The war was important because the military was able to take control of the country and make Spain a militaristic state. On 1, October 1935, Franco was given the title Generalissimo and was the head of the Nationalist Government. He was the leading general of the war and because of his high standings and military leadership he was able to gain the respect of the people of Spain and become the leader of the country. During the Spanish civil war we was able to further his power and increase his command to Head of State. Because of the weakening of Spain during the Civil War, Spain was unable to assist its fellow fascist powers, Italy and Germany, in World War II. By the time Spain was ready to assist Germany in WWII the war had come to an end. Franco then continued his rule of Spain until his death in 1975. After his death the rule of Spain was handed to his successor Don Juan Carlos. http://www.iiipublishing.com/franco.htm This site is about the life of Franco. It is a biography and tells about his 83 years of life in a condensed version. There are links to sites about his battles. It is a historical account of the Spanish Civil War and is a historical timeline. It is an excellent historical account to read if you do not know much about the Spanish Civil War. It is from an objective point of view and is a list of facts about the war. http://flag.blackened.net/revolt/spaindx.html This site offers much insight to the Spanish interpretation of fascism. It tells of the time period in which Franco gained power in the Spanish civil war. It is mainly a report of his deeds and exploits during the war and it gives much information on the subject. It is told from the Spanish point of view and shows Franco as a brilliant military leader. Adolf Hitler was born April 20, 1889 in the Austrian village of Braunau Am Inn. He was son of Maria Anna Schicklgruber. Hitler had wanted to become an artist but failed his art exams. He later joined the German army and fought in World War I. He only obtained the rank of corporal, but managed to survive the war unscratched. He returned home and joined the Nazi or German Worker’s Party. By the use of his speaking abilities he gained power in this party. He introduced his 25 Points and emphasized Germans being superior, much of this came from copying the Italian fascists. Hitler was named leader of the Nazi party in July of 1921. He promoted himself to authority by his speaking skills, he was a charismatic leader and people followed him because they liked him and his ideals. The Nazi party was elected to power in 1933 and Adolf Hitler was the Fuhrer of Germany from 1933-45. As Furher Hitler wanted to create a new state of people. He ordered ethnically and racially undesirable people removed from German society. Many were put into concentration camps; later many of these people were eliminated. Adolf annexed Austria and then invaded Poland on Sept 1,1937. Because Hitler invaded Poland Great Britain and France declared war on Germany. Because he gave the orders for Germany to start annexing countries Hitler is responsible for the start of World War II. The other countries wanted to stop Germany, and because Germany was so strong they could not do it alone. This forced many countries to join in the fight against Germany. Hence the start of WWII. Hitler led Germany through the war until its last few days. When Germany had all but lost, and facing impending failure Hitler took his own life on April 30, 1945.
http://www.historyplace.com/worldwar2/riseofhitler/index.htm This site offers extensive information on Hitler from his birth until his dictatorship, it offers few personal details and mostly just facts about his life. It answers most questions about his early years. A very good site, and it has many links. It is very objective for a site that is about one of the most hated people in history, which is why it is a good site. It offers lots of facts about his life and rises to power and created by a mass history web site intended to inform about history. http://www.remember.org/Facts.root.hitler.html This site features many important facts about the life and death of Adolf Hitler. It gives reasons for his actions and his hatreds, but isn’t too long. It is brief and too the point and gives an easy overview to his life. This is a good site for readers that are not interested because it doesn’t spend too much time on any one subject about his life. It states at the beginning of the site what it intends to teach the reader. A large history web site created this source. Pablo Picasso created the painting Guernica for the centerpiece for the Spanish Pavilion of the 1937 World's Fair. It is considered to be one of the greatest paintings of the 20th century. It is a painting representing he bombing of Basques by German forces in the name of the General Franco during the Spanish civil war. On April 27 the town was bombed, it burned for three days and over sixteen hundred were killed or wounded. The painting is a picture of great carnage and despair. It represents the destruction brought by Franco because of his promises of peace and prosperity. The bombing brought a massacre of civilian lives and the devastation of a city by Franco in his quest for power. The Massacre instigated mass protests in France when horrible pictures of the dead and wounded civilians. Many people objected to Franco’s war against the Loyalist because of this massacre. The painting by Picasso immortalized the sins of Franco in this painting. The painting is said to best capture the pain and sorrow of the event and the atrocities of war. It is a famous painting and a result of fascism in Spain. http://www.pbs.org/treasuresoftheworld/guernica/gmain.html This site shows a picture of the painting and insight on its meaning. It also has information about the bombing and Picasso’s inspiration for painting it. It is good to learn about the painting because it talks about the processes that Picasso went through to paint it. The source also talks about the personal aspects and why the painting is so important to the twentieth century. Admirers of the painting to tell the story behind the painting created this site. http://history1900s.miningco.com/library/weekly/aa062097.htm This site offers historical information about the bombing of the town and the events that “spawned” the painting by Pablo Picasso. It discusses the battle and what took place, it is about the horrors that were suffered and why it was such a destructive attack. It is all text and is a short description of the bombing. A 20th century history site created this site. Emperor Hirohito was the 124th emperor of Japan. Hirohito. He served sixty-three years in the position of the emperor until his death in1989. He was born in Tokyo in 1901 and he became emperor in the 1926. He was the longest serving emperor Japan has ever had. He ruled Japan during the Russo-Japanese war and World War II. He was not responsible for the attacking Pearl Harbor, and bringing America into World War II. That decision was not made by him but by his cabinet. This attack was foolish because it infuriated the American public, Americans felt that they were attacked off guard and unwarranted, this was “playing dirty”. It insured that America would not surrender or even negotiate with the Japanese. He was not a true fascist dictator. True, the Japanese were very accepting to the idea that theirs was the Master Race. Hirohito was an Emperor, and in alliance to Italy and Germany, but Prime Minister Tojo and his Cabinet had almost total control over Japan. The other group that was responsible for the leadership of Japan was the Liaison. It consisted of the Prime Minister, the Foreign Minister, and the Chiefs of the Navy and Army. Hirohito was more of a figurehead than a dictator. Other fascist countries were more dictatorships. Hirohito was more of a silent ruler who desired peace, and had urged for his officials to end the war in 1942. The first time his voice was heard by his people was when he surrendered to the Allied forces. Hirohito was still allowed to keep his throne after the war. After the war he then sought to improve the economy of Japan. He strived for this goal for the rest of his life as ruler of Japan. http://cidc.library.cornell.edu/DOF/japan/japan.htm This site is about Hirohito and Japan under his rule. It tells about his surrender and his death and the effects both of these events had upon Japan. It told a very brief summary of his rule over Japan, and more about how Japan was ruled by others. It showed his as a figurehead for a democratic leadership over Japan. This site is a history report and is made to inform about the Emperor and his role in WWII. This site doesn’t offer any personal information, but does give text and six pictures, and is written by a Japanese historical committee. http://motlc.wiesenthal.com/text/x19/xm1900.html This site was the most informative one that I could find about Hirohito and how he ruled Japan. It tells of the Japanese government and how it works, it also explains that Hirohito was not truly in control. It is very objective and explains Hirohito’s role in WWII. This site has text and is written by people who want to explain how the Japanese government worked during WWII. Hungary became a primarily fascist state when Admiral Miklos Horthy came to power in 1919. This was the beginning of the Horthy regime. Horthy was a very militaristic and fascist-racialist ruler. The people of Hungary were angry because of the post-war inflation and because they suffered social frustrations and economic insecurity. They blamed these problems on their ‘racial enemies’ and dealt with them in a most fascist manner. White Terror Squads were formed for beat, kill, and simply harass those that were deemed undesirable. Tens of thousands of social democratic shop stewards, anti-German journalists, young Hungarian poets, and Jews were extracted by the squads and handed over to the military. The military then marched, starved, and executed them. Hungary also surrendered over a half million anti-German politicians and other ‘racially unreliable’ elements over to the German Gestapo and SS. Hungary also passed mass censorship laws and propaganda was distributed throughout the country. In theses ways the freedoms of the people were severely limited. There were two fascist political parties in Hungary at the end of Hungarian rule in 1944. L. Baky, one of Horthy’s leading white terrorists, led the first; this party had about a hundred thousand members. The other was called the Arrow Cross, and in 1944 it had over half a million members. These groups were made of mostly unskilled, unemployed, or unorganized workers. Horthy’s rule in Hungary ended in September of 1944 when Germany invaded Hungary. http://www.hungary.com/corvinus/horthy/horthy01.htm The site here is an annotated version of the memoirs of Admiral Miklos Horthy. It is all text and is very long, it tells all about the deeds of Horthy while he was leader. There is no information about his life but it is written by Horthy and is from his prospective. There are no pictures but there is a great deal of information about what happened during Horthy’s rule. http://lycoskids.infoplease.com/ce5/CE024499.html This site is written objectively and was created by a history journal. It is a good site for biographical information about the main leaders in Hungary. It is all text and has good links to biographical sites. There are no pictures, the information is very brief, and there is no background information. The information is true and only covers the main points, such as the removal of undesirables and the invading by Germany. Joseph Goebbels was born on October 29, 1897 in Rheydt, Germany. Goebbels was the master propagandist of the Nazi regime and dictator of its cultural life for twelve years. Goebbels was a very creative man and used his creativity to persuade the public to agree with his views. Joseph had a general contempt for the human race in general, especially the Jewish. He used the Germans’ deep-rooted hatred of the Jews to ignite strong racist feelings in Germany. He promoted the idea that the Germans were the master race and that all others were inferior. 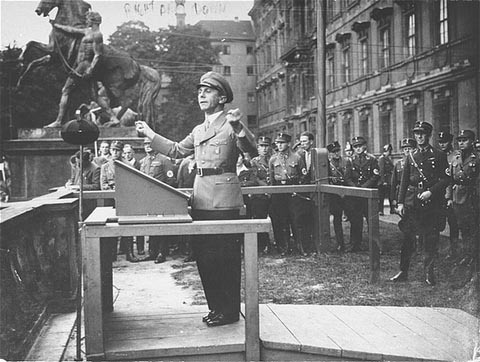 Goebbels wrote literature that ignited feelings in the German public. During the depression period in Germany Goebbels used the anger of the unemployed to gain even more support. Hitler was in agreement with Goebbels’ views and saw his immense potential as a political influencer. Hitler saw him as a rising political ally for the Nazi power. Hitler appointed Goebbels Reich Propaganda Leader of the NSDAP in 1929. Goebbels took his job as propaganda leader personally and put all of his efforts into promoting the Nazi party and its ideals. He widely publicized Hitler as a hero and protector of Germany from the Jews and Marxists. Goebbels was given free control over all the media, he used radio, literature, and pamphlets to force fascist ideas onto the German public. He was able to brainwash a large amount of Germany this way. His speeches were very popular, and he was seen as one of the greatest propagandists of the 20th century. During World War II Hitler became very close with Goebbels and ordered Goebbels to succeed him after Hitler committed suicide. Goebbels did everything he could to raise the moral of Germany in the final days of the war. In the end Goebbels had his wife and six children killed, and then on May 1, 1945, killed himself. Goebbels was one of the greatest promoters of the fascist cause in the early 20th century. http://www.us-israel.org/jsource/Holocaust/goebbels.html This site is several pages of text written about the political life of Joseph Goebbels. It discusses his actions and his accomplishments as master of propaganda in Germany. It talks little about his personal life, and his childhood. It is written objectively and talks about the facts of his adult life. http://earthstation1.com/Joseph_Goebbels.html This site is full of pictures of Joseph Goebbels and audiotapes of his speeches. To learn about him in visual and audio sound this is a good site. People who admired his genius and wanted to show the world his speaking abilities created it. The Italo-Abyinnian War was fought between Italy and Ethiopia. It is called the Italo-Abyinnian War because Ethiopia is located on the Abyssinian corner of the Horn of Africa. In September of 1935 Italy decreed that all of the Ethiopians were barbarians, thus giving just reason to invade Ethiopia. This was Italy’s attempt on Imperialism. The League of Nations did little to stop Italy from doing this. This was a victory for fascism and Italy as well. Great Britain and France imposed an embargo on Italy, but they stood alone because Germany, USA, and Russia didn’t comply with the embargo. Mussolini then denounced Great Britain and France as Italy’s eternal enemies. Mussolini then ordered his delegates to leave the League of Nations. The sanctions were then dropped in July of 1936 although the damage had already been done. Benito Mussolini now held a deep grudge against Great Britain and France. http://ac.acusd.edu/History/WW2Timeline/step03.html This site gives dates, place and battles on the Italian war with Ethiopia. It is a list of facts and a good place to find specific information about the events of the war. It gives links for more information about other aspects of the war. http://ac.acusd.edu/History/WW2Timeline/ethiopia.html This site offers vast insights to the political and social effects of the war. It tells why the war was such an important event in history. It tells what were the reverberations of the war and the reactions of other countries. Emperor Haile Selassie was ruler of Ethiopia from 1930 until 1974, when his own guards) dethroned him. It was Haile Selassie, he was not a fascist dictator, and he united Ethiopia when the fascist forces of Italy aggressed upon Ethiopia. Selassie appealed to the League of Nations because Ethiopia could not win against Italy, so he tried to solve the matter peacefully. Haile Selassie appealed to the League of Nations Assembly in 1936 by stating that Italy had violated international treaties. The League of Nations did nothing to help Ethiopia; therefore Italy then occupied the country as a new territory. Because of this outside aggression Haile Selassie was able to unify Ethiopia. All of the various ethnic groups of Ethiopia put aside their differences fight fascist Italy. This unification was used as a survival method for Ethiopia and after five years of occupation Ethiopia emerged a new nation-country. Haile Selassie benefited more from loosing than Italy did from winning. This is one positive thing brought about by Mussolini and fascism. http://website.lineone.net/~mighty_dread/haile.htm This site is all about the life of Haile Selassie. It is a biography and will tell you anything you want to know about Haile Selassie. A very good information site. http://www.boomshaka.com/HIM/him.html This site has pictures of Haile Selassie and a collection of his speeches. It shows the opinions and accomplishments of the leader. It allows you to know Haile Selassie more intimately and gives in-depth information on the lees important things that he did. 1. Laqueur, Walter. Fascism. Berkley, CA. University of California Press, 1976. This book discusses fascism and defines it clearly. It talks about its poetical and social views. It gives information on Mussolini in an objective format and describes fascism’s gain in popularity and power. It mainly concentrates on what fascism is and how to define it. It talks about the good points of it and the high ideals that it first had before it became a corrupt quest for power over the people it was supposed to help. It also tells how it was supposed to make all workers equal and how it went wrong by corrupt officials. 2. Halperin, Samuel William. Mussolini and Italian Fascism. Princeton, NJ. Van Norstrad. This book is a basic step-by-step manner of how Mussolini started the Fascist Party after returning from the First World War. It talks about him gaining power through the party and becoming ruler of Italy. It tells of him siding with the Germans and accounts of his life, right up until his death. This is a detailed historical account of the life of Mussolini, the laws that he passed, and the speeches he made. It is objective, and doesn’t tell the views of the people under Mussolini’s rule. It is simple facts about his life and his rule in Italy. 3. Reich, Wilhelm. The Mass Psychology of Fascism. New York, NY. Farrar, Strauss & Giroux, 1970. Fascism appealed to the large “masses” of the poor and working class in the early to mid twentieth century. They enjoyed the ideals becoming equal and the elimination of unemployment by the use of government work camps, and the idea that “their” ethnic group was the best and that all others were inferior. Also the public was brainwashed by the elimination of all other political parties. Education was also changed to favor fascism by censoring in schools and widespread propaganda. It also talks about how fascism was easily accepted by the Germans. The Germans already had a high sense of nationality and morality. Fascism took many of the basic beliefs that were held by the Germans and Italians and used them to bring popularity to the Fascist Party. 4. Wilkinson, Ellen Cicely. Conze, Edward. Why Fascism. New York, AMS Press. 1973. This source discusses the reasons why fascism became so popular in some areas and why it did not work in others. Fascism was very appealing to some, but to the more diverse ethnic regions it didn’t have the same effect. The British saw fascism as a system of contradictions and also didn’t agree with the censorship that limited the freedoms of thought. Fascism was also suited for more of a “village” economy rather than a complex one such as Great Britain’s. This failure proved major faults in fascist planning. 5. Gregor, A. James. Interpretation of Fascism. Morristown, NJ. General Learning Press, 1974. This book singles out fascism and studies each part of it. It uniformly explains fascism on each level. It looks at history in retrospect and talks about censorship and control in everyday life. It also talks about the gaining of respect through fear and how Secret Police were used to take people in the night. It explains this and other tactics that were used to gain control over citizens. It studies fascism piece by piece rather than as a whole. It is mainly a negative report of fascism. It is all about how and where fascism went wrong. 6. Eisenberg, Dennis. The Re-emergence of Fascism. South Brunswick NJ, AS. Barens, 1968, 1967. This source explains how fascism is still around today. Fascism did not end after World War II, there are still people who would like to censor information and inhibit learning. Fascism is widespread throughout the world and this book documents many of the accounts of people using the ideals of fascism to influence public thinking. It discusses the prejudice against communism in the US and the prohibiting of certain books to be published. Fascism left a huge print in society, the ideas have certain amounts of truth to them and because of that they have been inextinguishable. This book talks about this and intends to inform the reader of fascism that you may or may not have realized. 7. Cohen, Carl. Communism, Fascism, and Democracy, the Theoretical Foundations. New York, Random House, 1972. This book compares and contrasts the three economic and political theories of each in great detail. It explains what each policy stands for and it’s basic beliefs. It talks about the founders or origins of each and compares them to each other. It shows how each of them is so very different for the other. How majority rule is different form absolute rule by one. It shows how Communism is perfect for small groups and falters in large ones. How government influences is needed, but private ownership is also effective. This book gives a total objective aspect to the three theories and points out the high and low aspects of each. 8. Tanin, O. Ioquan E. Militarism and Fascism in Japan Westport, Conn. Greenwood Press, 1973. This book talks about fascism from the Japanese point of view. It does not treat Japanese Imperialism as an isolated phenomenon but show its development against the background of the modern history of the pacific imperialist power and of the social crisis, which it was undergoing. The Japanese had to suppress its workers before it could expand to other countries. The Japanese were struggling with two separate classes, finance capital and semi-feudal landowners. It also had to deal with groups that were pro-monarchy and anti-parliamentary. Japan was run by a parliament and was leaning away form monarchy, even though it still held an Emperor, Emperor Hirohito. This book tells of how Japan formed their own hybrid fascism to suit their strong military, which at the time was the backbone of their society, their ambition for annexing countries, and their desire to keep their culture from changing. 9. Woolf, S. J. Fascism in Europe. Methuen, London & New York. New York, NY. 1968. This book tells of fascism and how it affected the countries in Europe. It tells of how fascism for each country would meet, intermingle, borrow from each other, combine, and fight each other. It showed the eclectic ways that fascism could be interpreted. That there was no true fascism and many of the country’s fascist movements were pro-nationality or patriotic movements. This book talks of fascism in Italy, Germany, Austria, Hungary, Rumania, Poland, Finland, Norway, Denmark, Great Britain, Belgium, France, and Spain. It is objective and discusses the ideology of the nationalists of each country, and the domestic political context of each individual country. It talks of the opposition that the fascist parties faced and the extent to which each country carried out the anti-Semitic ideals. Because each country reacted differently and their additives were so varied the results of each is likewise varied. 10. King, Dennis. Lyndon LaRouche and the New American Fascism. Doubleday, New York NY. 1989. This book is an account of Lyndon LaRouche. Lyndon was a political extremist in the 1970’s. He wished to create a state of mind akin to that of the Nazis that prayed upon the inbred hatred of other races. He formed The National Caucus of Labor Committees (NCLC). He achieved a surprisingly large amount of support, much of it because of his anti-Vietnam War views and his open aggression against gays. This book tells of a man who had many of the same ideas as Hitler becoming a popular political figurehead. It shows a detailed report of his rise in power and what his beliefs were. It also points out his many faults and his similarities to Adolf Hitler. It shows that a mistake such as the Nazi Party could have happened to America in the 1970’s. 1. Bios: Benito Mussolini. [Internet Bios] Accessed 19 Feb 2000 at Http://library.thinkquest.org/17120/data/bios/mussolini/ ; Internet, NA, ND. This on-line biography of Benito Mussolini is a short, condensed version of his life. Mussolini was the leader of the fascist party in Italy. This site gives basic, yet essential, information on how fascism was founded and brought to power. I found it very informative and consistent with all other information that I have found on the subject of Mussolini. It is made of numerous pages about his life. This site tells an objective view of facts. It tells about how he grew up, his introduction to politics, his war efforts, and what he did while he was in power. This site is the next best thing to reading a whole book on Mussolini because it is long enough to paint a detailed picture of his life, yet short enough that you don’t lose interest in the subject. 2. Bios Adolf Hitler. [Internet Bios]. Accessed 19 Feb 2000, at http://libraryquest.org/17120/data/bios/hitler/ ; Internet. NA, ND. This is a biography of Adolf Hitler. Hitler was the leader of the Nazi Party in Germany. The Nazi Party was a large fascist movement and therefore his biography is important to this subject. This site is a detailed report on the life of Hitler. It starts in his early childhood, continues through his schooling, into his military career in World War I, his political career after the war, his rise to power in Germany, and his exploits during the Second World War. It is an objective and clean-cut view of the facts of his life. It shows the life of the man who led fascism in Germany. It also has several good links to sites about WWII, and the Holocaust. 3. The Eight Roads to Fascism. Accessed 19 Feb 2000, at http://www.geocities.com/CapitolHill/1131/8_main_roads.html ; Internet, ND. NA. This site discussed what the author called The Eight Roads to Fascism, it is a site that talks about the political theories behind fascism and how they are used today. It gives short and simple views on commonly used fascism. It points out that the beliefs that fascism is built on and how they are interpreted. It is a good site because it seems to be written from a fascism supporting point of view and gives an account o how supporters see fascism. 4. Trotsky, Leon. Fascism – What is it and How to Fight it [online article] Pamphlet. Accessed 19 Feb 2000. http://english-www.hss.cmu.edu/history/fighting-fascism/default.html ; Internet, ND. This gave a brief history and definition of fascism. It talks about how fascism started from the petty bourgeoisie and its rise to power by the large masses. This site talks from the viewpoint of Leon Trotsky and has an anti-fascist point of view. This site talks about how the Germans adapted fascism and how it grew and took on extreme measures. It mainly explains how the attitudes of the working class affect the growth and diminishing of fascist policies. It put great emphasis on labor unions and opens thinking. It persuades that the thought “that each man can make a difference” is a great way to fight fascism. This site also has links to other sites. 5. Fry, William. John, Tortorice. John, Tedeschi. Italian Life Under Fascism. [Online book] University of Wisconsin-Madison. Accessed 19 Feb 2000. At http://www.library.wisc.edu/libraries/dpf/Fascism/Home.html Internet, ND. This book offers a very informative forward. I found the forward to be an excellent account on early fascism. The book is mainly made of pictures, posters, book covers, and propaganda pamphlets. Next to each of these pictures is a detailed explanation of what it was, whom it was meant for and the message it presented to the audience. This helped the reader enter the minds of the people in Italy at the time of fascism. It showed how the government increased the feelings of Nationalism and brainwashed the youth. It shows you the tactics and slogans used to promote fascist ideals and hatred. 6. Umberto, Eco. Eternal Fascism. Fourteen ways of looking at a Black Shirt. [Online article] in New York Review of Books, 22, June 1995. Accessed 19 Feb 2000. At http://www.sente.net/~bkeith/Eco.html ; Internet. This article views today’s fascism or “Ur-Fascism” in many ways. It offers many new ideas about fascism and how it is tied to nationalism and selective populism. It offers deeper meaning in explaining fascism other than simple “contempt for others”. This site shows that fascism is faceted so that it has many different levels of oppression. It helps to understand why fascism is so object able. It also has links to other fascism sites. 7. Auschwitz [Internet site] Accessed Feb 20, 2000. At http://members.dencity.com/lukeworld/aushwitz/AUSmain/htm ; Internet, ND. NA. This site is all about how the Jews were treated in the Concentration Camps during WWII. The concentration camps were a result of fascist thinking and beliefs. They are some of the darkest pages in human history. This site explains how the Jews were rounded up, shipped away, forced to work, starved, and killed at the concentration camp of Auschwitz. 8. CARF [Internet Magazine] Accessed Feb 21, 2000. At http://members.dencity.com/lukeworld/aushwitz/AUSmain.htm ; Internet. NA, ND. This site is a magazine that is published six times a year in the United Kingdom. It is dedicated to ending the fascism that is still around today. It offers valuable insight on what and where fascism is in the world. It also informs what is being done about it. Such as editing textbooks of elementary students and searching for fascist propaganda, and informing the public about the evils of fascism. 9. Keiper, A. Mussolini in Pictures [Internet site] Washington D.C. Accessed 20 Feb 2000. At http://www.gvn.net/~1owe/mussolini/d1.htm ; Internet. ND. This is a site that shows pictures of Mussolini. It is important because it gives a visual view of the founder of the Fascist Party. It is important to know what the person you are reading about looks like. This sit also has links to more informative sites. This site gives visual aides to the learning about Mussolini experience. This site is an objective and offers true picture. 10. Grobman, Gary A. A Teaching Guide To Hitler. http://www.remember.org/Facts.root.hitler.html [Internet site] Accessed Feb 20, 2000. Made 1990. This site features many important facts about the life and death of Adolf Hitler. It gives reasons for his actions and his hatreds, but isn’t too long. It is brief and too the point and gives an easy overview to his life. This is a good site for readers that are not interested because it doesn’t spend too much time on any one subject about his life. It states at the beginning of the site what it intends to teach the reader. A large history web site created this source. Can You Find the Fascist Dictator? Try the web site above to test your knowledge of fascist dictators. hits since 4 August 2006.